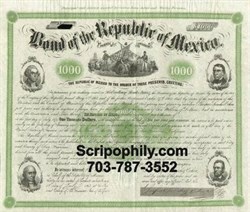 Beautifully engraved certificate from the Republic of Mexico issued in 1866. This historic document has an ornate border around it with a vignette of four presidents. This item has the signature of General Ocha and is over 146 years old. Punch hole through serial number.